Kind of gross, but kind of delicious. 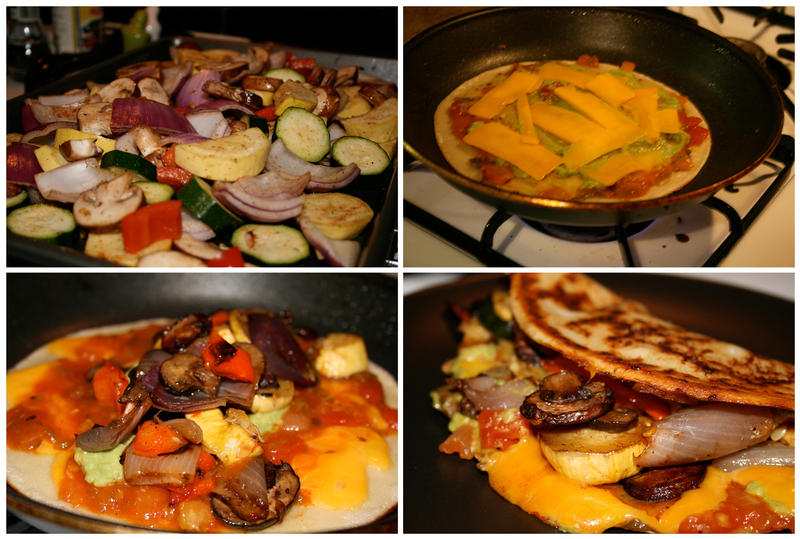 I often roast a variety of veggies and either just eat them like that or make veggie quesadillas. The other day I had bought veggies but no tortillas and I had some crepe batter leftover so I thought it might work. The veggies are tossed with a ton of pepper, sometimes a bit of salt, and in this case some sort of limey seasoning stuff. I always roast my veggies at 475 F for a total of 40 minutes, pulling the roasting pan out of the oven and mixing up the veggies every 10 minutes. I made some quick guacamole using just a half of an avocado and added it to the crepe in the pan along with some salsa and cheese and then put some veggies in the center. Fold up, eat, repeat if necessary. Definitely need a can of Coke with this one. This entry was posted on March 10, 2010. It was filed under Cooking.